Background: Cyclooxygenase (COX-2) inhibitors have been developed to provide better anti-inflammatory and analgesic efficacy than those of traditional NSAIDs. Several compounds having selective COX-2 inhibitors such as SC-558, Celecoxib, Rofecoxib, Valdecoxib and Etoricoxib are marketed as new generation NSAIDs and block the production of prostaglandins (PGs) in inflammatory cells. New anti-inflammatory agents with improved potency and safety profile are still needed. 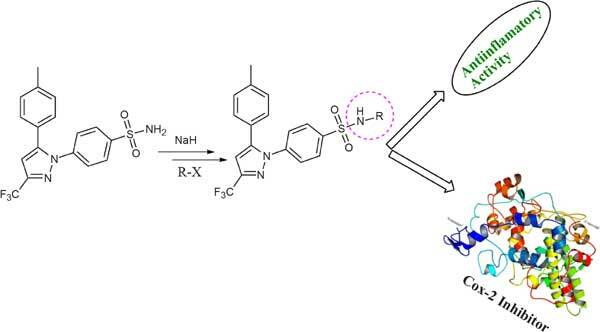 Objective: As a part of our continuation research work towards new anti-inflammatory agents, the synthesis of N-substituted aryl/heteroaryl-pyrazole-1yl benzene sulfonamide (Celecoxib) derivatives, their anti-inflammatory activity in both methods in vitro and in vivo and molecular docking study on COX-2 enzyme will be discussed in this study. Methods: A series of N-substituted (aryl/heteroarylpyrazol-1-yl)benzenesulfonamide (Celecoxib) derivatives was synthesized and characterized them using IR, NMR (1H and 13C), mass and elemental analyses. Anti-inflammatory activity of the title compounds was evaluated by in vitro initially using albumin denaturation and membrane stabilization methods, enzymatic activity against COX-2 enzyme using colorimetric assay and then in vivo by carrageenan induced paw oedema and cotton pellet induced granuloma methods. The docking study was performed, to find the binding mode of the title compounds with the binding site of the COX-2 enzyme. Results: The biological activity screening data disclosed that some of the compounds 5b, 5e, 5f and 5i exhibited potent anti-inflammatory activity in both methods, in vitro and in vivo. The enzymatic assay on COX-2 enzyme demonstrated that few compounds potently inhibit COX-2 enzyme activity with IC50 of <0.89 μM. Unexpectedly, compound 5e (IC50, 0.62±0.17 μM) showed more potent COX-2 inhibited activity than that of parent drug, celecoxib (IC50, 0.62±0.25 μM) and the standard, flufenamic acid (IC50, 0.71±0.12 μM). Conclusion: The bio-screening data, in vitro and in vivo anti-inflammatory activity and COX-2 enzymatic assay revealed that few N-substituteed aryl/heteroaryl-pyrazol-1-yl) benzene sulfonamides showed potent activity and compound 5e showed more potent COX-2 inhibit activity than that of parent drug, celecoxib and the standard, flufenamic acid. Moreover, all the newly synthesized title products were bonded well with good binding energies in the sight of COX-2 enzyme. Therefore, the described study might provide sustained information to the development of new series of derivatives with potent drug like activity. Albumin, anti-inflammatory activity, celecoxib derivatives, molecular docking study, cyclooxygenase-2, NSAIDs.